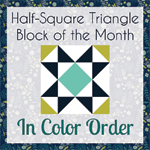 Welcome to the Half-Square Triangle Block of the Month! 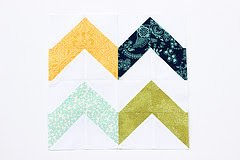 For each month in 2012, I'll present a quick tutorial for a traditional quilt block using half-square triangles! It's going to be a lot of fun, feel free to join in at any time! I LOVE half square triangles!! 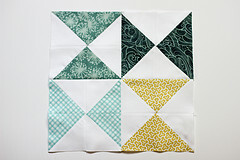 Definitely in on this one.. Now to pick a fabric collection...mmm... Love your blog! that's a very good idea to use some fabric from my stash :-) I definitly will join in! Thanks for the inspiration! Defiantly going to be quilting along! I'll post my progress in my blog, thanks for the inspiration to get me going! Thanks, I need a few 'triangle' blocks to finish a bee quilt so this will be a lot more interesting than me just winging it. just added your button to my blog!! now i AM committed (most of my family thinks i should be ha!) such a great way to start the new year~thanks for the quilt a long, i will begin choosing fabrics now~oh happy day! and hopefully i will get back on track blogging my progress! oh how half square triangles will renew the soul! I am joining in. Now to head into my stash and see what I can find. Love your blog and your bunny! I know I don't NEED another project, but this sounds like something I can keep up with along with working on my UFO/WIPs. I'm joining up! 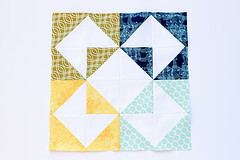 Oh yes another QAL, will add it to my list of ones I am doing it will be done scrappy to help curb my scraps, and shopping from my stash too! Just found you via One Pretty Thing. Love your site & sensibilities! I wish you much success with your 2012 goals. 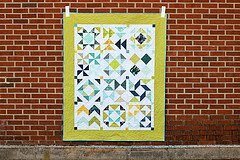 I think I'll join along for this HST challenge - I'm a fairly new quilter, so this will be a good way to expand my skill set. I don't have much of a stash but bought a charm pack I really loved. Do you think the 5" squares will be adequate for these blocks? I really don't need another WIP right now, but I am anxious to give this alternative method a try. Having made 2 house moves in 2011, I'm not really sure where all my stash is. Oh, well, a run to the fabric store at lunch was therapy right? OMG! 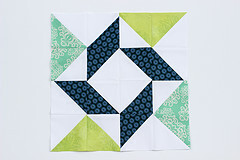 This block went together so quick and easy. Can't wait for next month. See my blog for pictures. Ok, I am going to quilt along with this one! So excited! Thanks! Your directions make it seem so easy. I discovered it late, so I guess I will be the leader of a month late Block of the Month club. There are 11 months to go so maybe I can catch up. Thanks for the directions! This looks like fun. 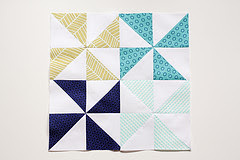 I've added the button to my blog and am off to find some fabric in my stash! I just saw this, and I know the end of January is here, but I'm jumping on. I love working with hst. The first one is finished, am waiting eagerly for the next challenge! I think this is a great idea. Love the patchwork chevron. Love the white as back groune! Great look. count me in! I've put the button on my blog and I'll catch up with the January & February blocks next week so I'll be ready & all caught up for March! 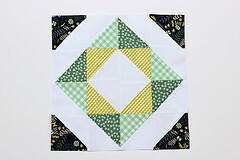 I have posted the first 2 blocks on my blog, and will follow along with you. Looks like fun. Okay, I have a question! I'm going to do the Jan &Feb blocks this week so I'm caught up for March. I think I would like to use my stash of batiks against black. But I'm not sure how to incorporate black. Is it as simple as using the black instead of the white on backgrounds? Or is there another, better, way to get the black in there? I have 2M of a small black/grey on black rather than solid black. Would you recommend a solid black instead? 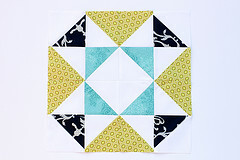 I,m not an experienced quilter, so using black instead of white is stretching my boundaries, which is a very good thing! Looking forward to quilting along with you all! Thank you Jeni for preparing this great tutorial. Using scraps & a small amount of stash, I've made Jan & Feb & can't wait for March! These are so easy & fun! I'm having shoulder surgery next week & will have my arm in a sling for a whole month!!! I'll have to get it done before i'm done. 8^( Kisses for George, really enjoy your blog... keep up the great work. thanks so much for the tutorial, i look forward to this quilt along each month! Just found this yesterday! 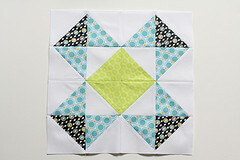 I love HST's, so I have mine all cut out for the first 4 blocks and am getting with the program! Just love QAL's and BOM's!!! Thanks so much! 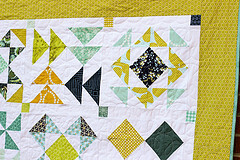 Love half square triangles ! 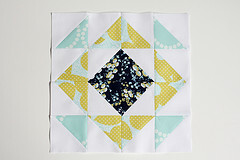 Im doing the Craftsy Block of the Month but just might have to be tempted by yours too ! Too many quilts....too little time ! I just discovered this. I am going to join in soon I hope! This is such a fantastic initiative! I really want to join in. Am I too late. I think I go back and do the squares for January, Febuary, March and April ASAP (hopefully by May) :D.
Hey, I just want to let you know how much I am enjoying working on this BOM! Thanks for doing it! Also, I love your blog and quilts! I finally got started, but what I'm doing is 6.5" blocks instead of 12.5". I had a couple of nice FQs I wanted to use for something, and with some coordinating fabrics, I'll have plenty of fabric. I spent a little time yesterday cutting 2.5" squares, and now I can just grab the ones I want for a particular block and whip it up. I'll post pics after I get some more blocks made. 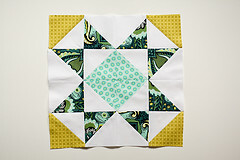 Well, I have just started my first block for this HST QAL. It's my first QAL and also my first triangles EVER!!!!!!!!!!!!!!!!!!!!!!!!!!!!! Fun, but not all that easy. You help make it easier. I love all your work. Love, love, love. 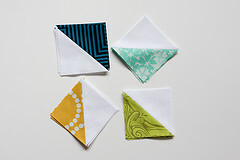 I may be a late starter - but looking forward to catching up---I'm making a 'gift' to my sister and giving her an assortment of half-squares already made for her to make her own quilt!! I love the colors and fabrics you chose! 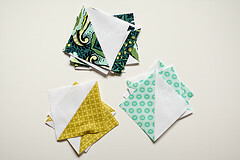 I'm going to ave to g get some fabric tomorrow and catch up, what a great idea! I've seen so many HST's and have been thinking of trying some out (I am a newbie). After seeing this, I will play with some tomorrow, in anticipation of starting a new quilt. Need to finish my tumbler quilt first I guess. Thanks for sharing your know how and samples! Is anyone else excited that tomorrow is the first of the month which means a new block? Can't wait! I caught up with 8 blocks in just a couple of weeks and I'm eager for the next! HSTs are the best. I love the endless possibilites. 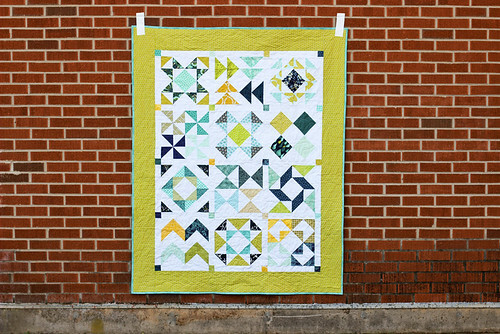 I would like to make an entire quilt from the October block! Using a variety of fabrics keeps this from getting monotonous. I found these today and I'm thrilled you took the time to do this with your busy schedule. Thank you more than you know. I've printed up the blocks and will get started probably in January since we are so close to the holidays. I feel like you have given me a special gift because I'm a confident beginner and I do love these HST's. Thank you. 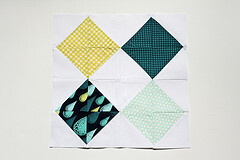 I think I may like this block best of all !I can't wait to see how this quilt finishes up. I need to go to find a great backing for this, now! Its December and only discovered yout HST Block of the Month NOW.. doing to make them non the less.... :-) Hope you will have something similar next year? Thank you Jeni for your inspirational and motivational BOM, it sure has been a pleasure to participate. Congratulations on your finished quilt the colours scheme is so savvy. Jen by any chance will you be doing another Block of the Month 2013? Just finished all my blocks- they are gorgeous! Thanks for the tutorial! Oh my I love this! How did I not do this last year? I am starting now! I'm with Vikki....I'll be pulling fabrics this weekend! Wonderful! This will make a great wall hanging (downsized) for my grandsons' room for whom I just made HST Chevron quilts! Most excellent. While cleaning up my sewing room today Guess what I found yes my HST quilt, Only have 2 more blocks to finish then I have to sash it, put the borders on and quilt and bind. So loved this BOM thanks Jenny for such easy instructions. Thanks for the pattern. I really enjoyed doing it with you.